Ficus trees are popular indoor plants for homes, lobbies and offices. If you have a ficus tree, you have probably experienced leaf drop, because if a ficus tree decides it is in stress, one of the first thing it does is drop its leaves to survive, and it will do this fairly quickly. There are only a few requirements a ficus tree needs to be happy and keep its leaves. Understanding and providing these requirements should eliminate your ficus leaf drop. Keep your ficus in strong, intense light. During the winter months, when light weakens, you may need to move your ficus to a stronger light. Be aware that, because the ficus is sensitive to change, it may drop leaves when you first move it, but it will recover in thirty to sixty days. Avoid placing your ficus where there may be a draft or temperature changes, like near heating vents. This, too, will cause your ficus to drop leaves. Water your ficus only when the soil feels dry when you stick the tip of your finger into the surface, as ficus will drop leaves if it is over watered. Alternatively, if you allow its soil to dry out too much, too often, the tree will also drop its leaves. Instead, keep the soil evenly damp and use only room temperature water, never cold water, which may cause your ficus to go into shock. Check your ficus for pests; white flies and aphids are the most common. If you discover these pests, treat your ficus with an appropriate pesticide. Your local garden center, florist, or nursery should have this available. Once your ficus is happy in a location, do not move it; it cannot be stressed enough that ficus hate change. Under-fertilize, rather than over-fertilize, your ficus, as too much feeding will cause it to lose leaves. 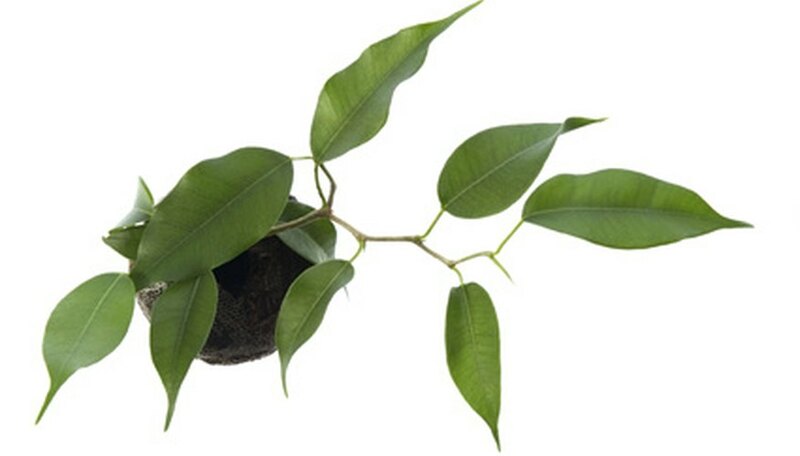 Ficus only needs to be fertilized three times a year: early spring, mid-summer and early fall. Ficus sap may cause irritation to your skin.